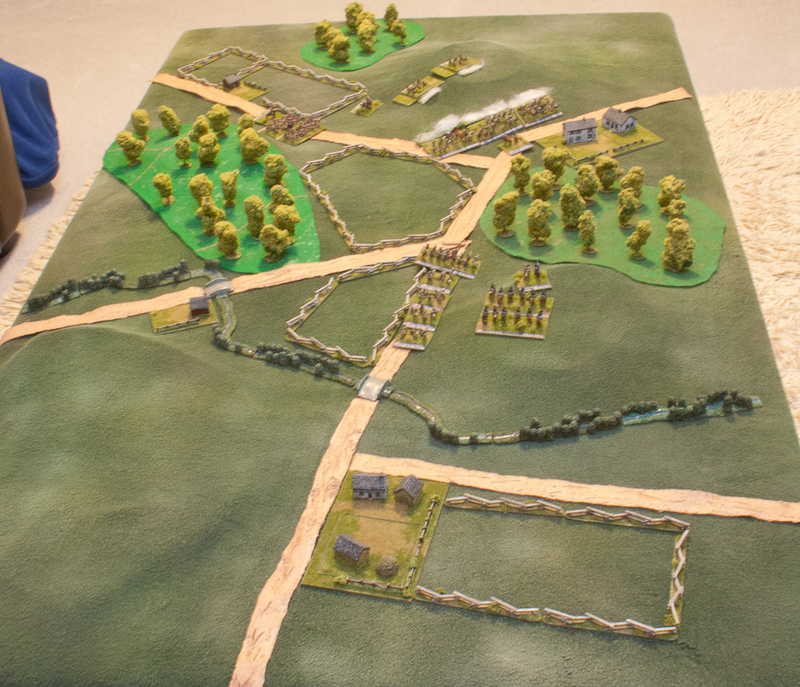 After real life of myself and others had interfered with my plan to christen my AWI on 15 March, 233rd anniversary of Guilford Courthouse, and a subsequent attempt I decided to go with a solo game. I am using the Volley & Bayonet Wing scale variant “At War in the Americas”. 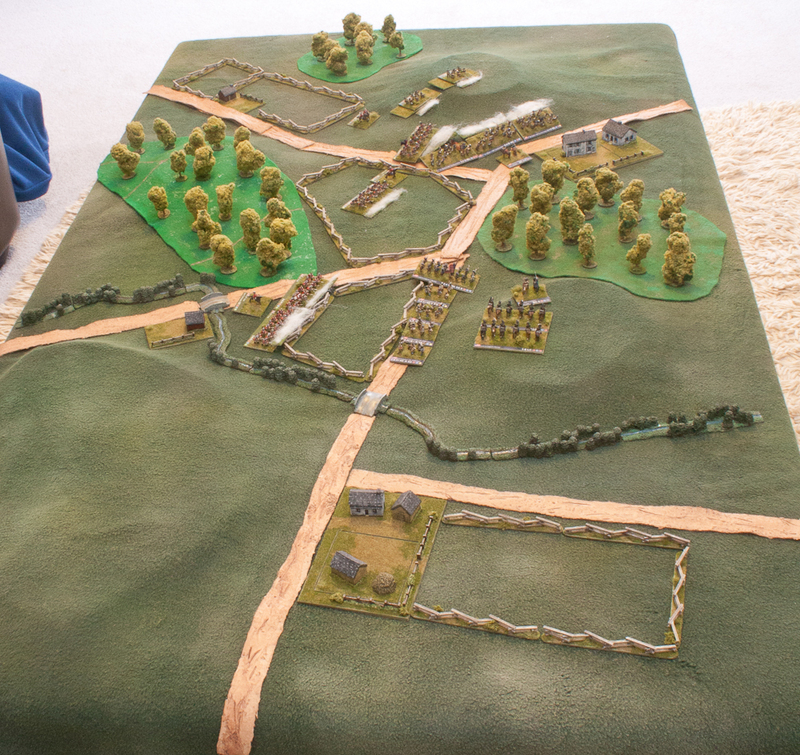 I set up a small, 5’x3’, table with some hills, woods, buildings, fences and two roads on each long table edge. Both forces logically divided into four components; for the British each was a battalion, for the Americans each was a brigade or similar. Each turn I rolled one D6 for each road to determine which of the components 1-4 came on that turn. If a 5-6 or an already arrived component was rolled nothing came on that road that turn. I then did the best I could for each side based on what was on the table. This seemed to generate enough uncertainty in the plans of both sides to lead to an interesting game. In all photos of whole table the British are on the left and the Americans on the right. On turn 1 the British got only the Hessian Jägers on their left. While the Americans got Lee’s Patizan Legion on their left and Butler’s North Carolina Militia Brigade on their right. The Hessian Jägers moved up onto the hill and fired into the flank of Butler’s Brigade. Despite being sharpshooters they rolled no higher than a 4 and all missed. Meanwhile the 23rd Foot also arrived on the British left. Butler managed to turn his Militia to fire on the Jägers on the hill. His first battalion was surprised to see the British advancing rapidly up the road. On the American left Lee moved his Legion to Butler’s support. This turn saw a lot of action. 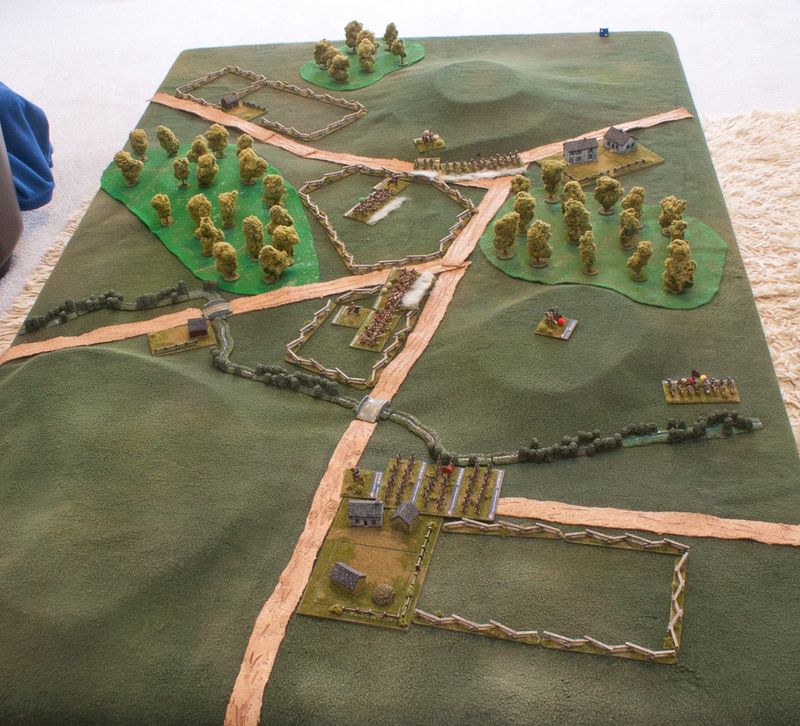 The 33rd Foot arrived on the British right, deployed and fired into the flank of Lee’s Legion, all missing. Half of 23rd Foot advanced into the central field and also missed Lee’s Legion. The other half of the battalion charged the left of Butler’s Brigade with dramatic results. 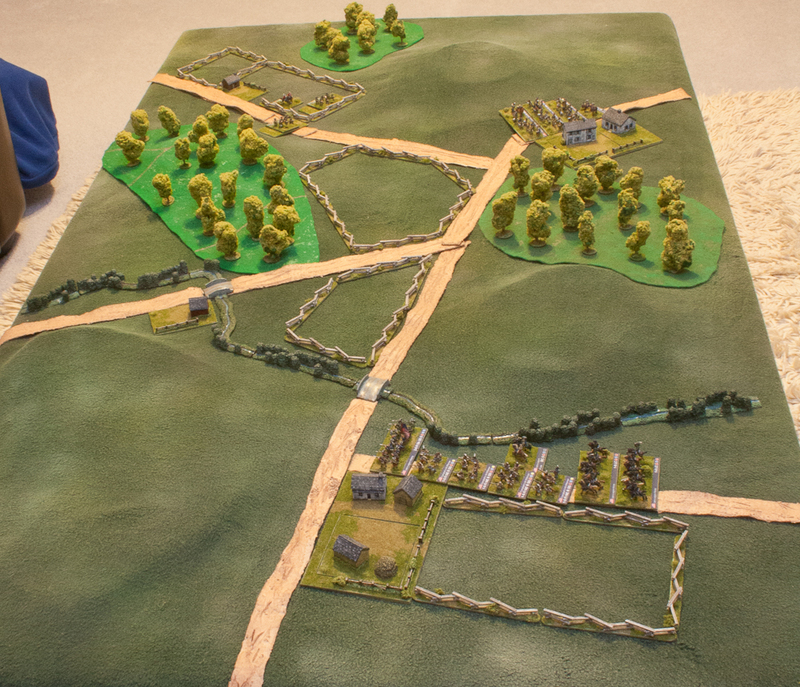 Butler’s first battalion failed it’s morale test and as it was already disordered because it is Militia it routed between the wood and the buildings. 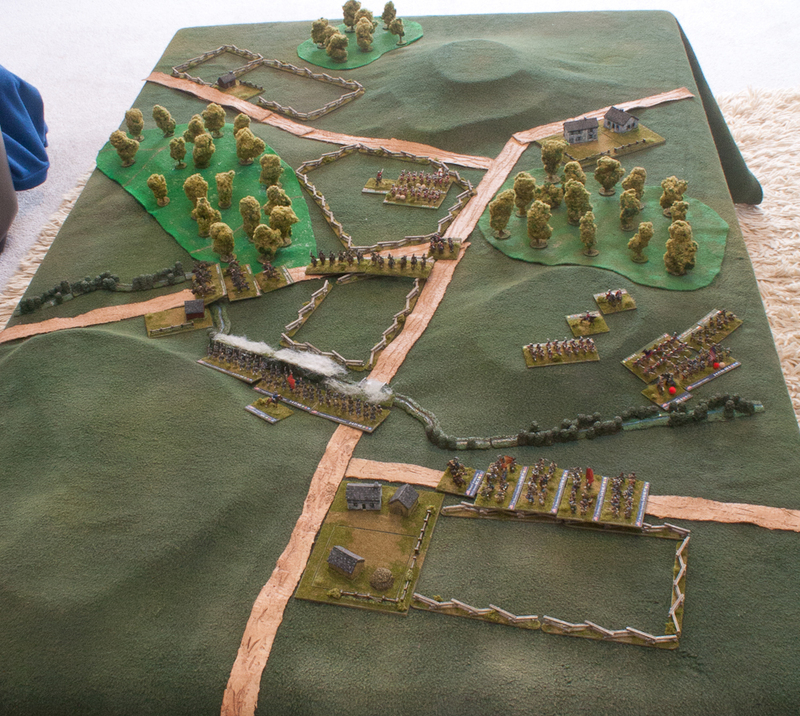 The British broke through onto the flank of Butler’s second battalion. Much to everyone’s surprise this battalion passed its morale, it rolled the required 1 on a D6. This meant a melee, which the British won. This routed the second battalion through the third battalion, which joined it in rout. This exhausted the brigade which promptly failed its exhaustion test causing it to collapse. All the routing stands were therefore removed. Leaving Butler wondering how it had gone so wrong so quickly. Lee decided that an immediate counterattack was required to restore the situation before the British could regroup. He charged the isolated right wing of the 23rd Foot with the infantry of his Legion supported by one troop of Dragoons. Meanwhile Campbell’s Virginia Riflemen turned and fired on inflicting one hit. 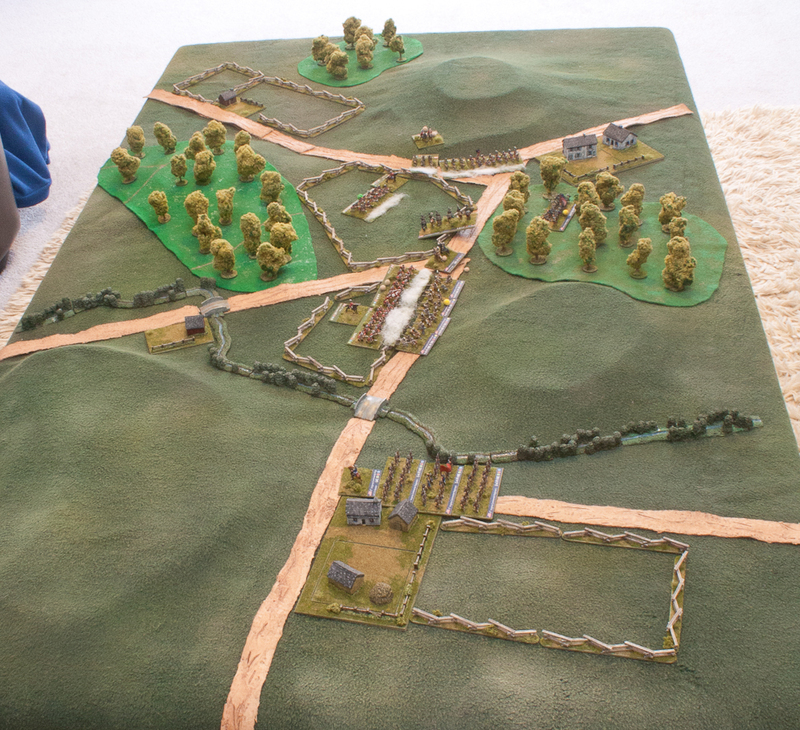 The Fifth Virginia Continental Regiment arrived on the American left and moved towards the central bridge. Lee’s gallant charge did not go as planned. The Dragoons cleared the snake fence but failed to inflict a hot on the British. Likewise the Legion infantry failed to score a 6, so no hits. The British rolled two dice against the Legion infantry, no hits. They roiled one against the Dragoons, a 6, the dragoons are removed, dead, and the Legion infantry retreat disordered into the wood. The 33rd Foot was suffering from the accurate rifle fire so responded by charging. The 23rd Foot and the Hessian Jägers redeployed to fire on the remaining dragoons of Lee’s Legion. One of the detachments of Campbell’s Riflemen failed its morale test and was disordered. Unfortunately this was the one of the two stands that hit in the melee and the British saved successfully. In return they rolled three 6s out of six rolls. This was enough to exhaust Lee’s Legion who then failed their exhaustion test and collapsed. The survivors of Campbell’s Riflemen were removed and the Legion infantry routed through the wood. 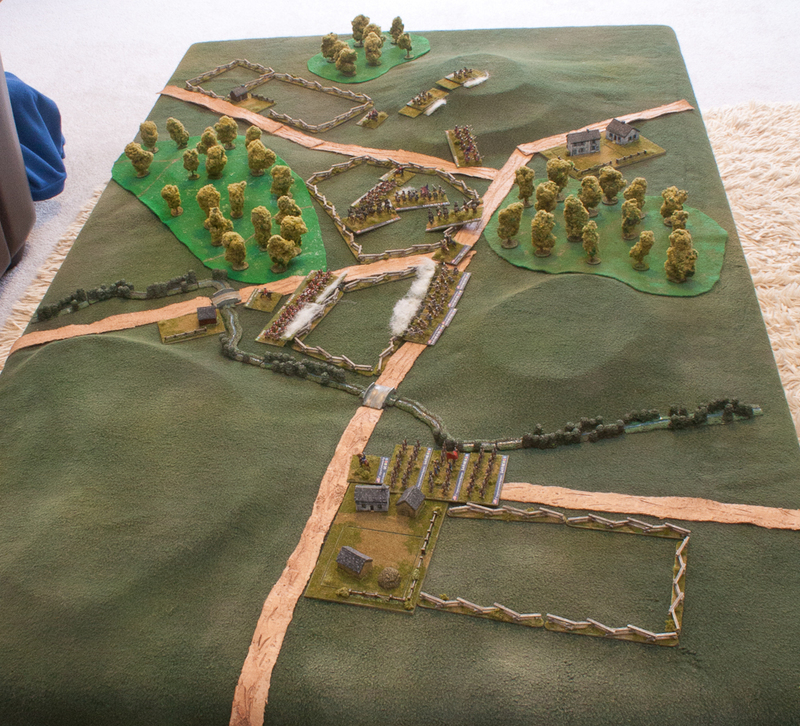 Lt Colonel Hawes commanding the Fifth Virginia Continental Regiment was stunned. His was the only intact American unit on the field. The British Legion Dragoons arrived on the British left. This allowed the British infantry to advance to the right and apply pressure on the Continentals and the survivors of Lee’s Legion. Concerned about the casualties suffered by the left wing of the 33rd Foot Captain Cornwallis holds them in reserve. The Fifth Virginia Continental Regiment deployed along the stream between the two bridges and fired on the 33rd inflicting two hits. 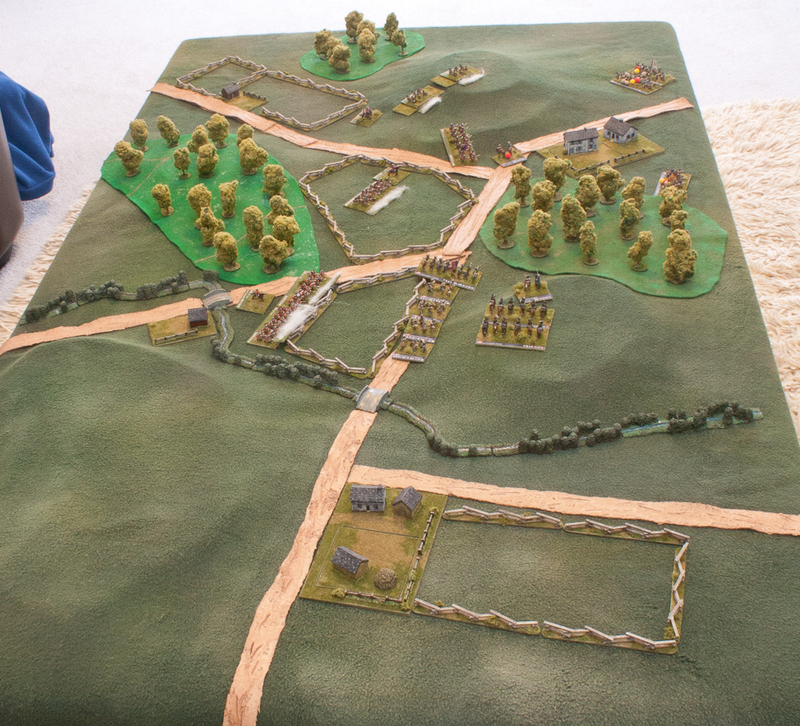 The remaining American unit, Steven’s Virginia Militia Brigade arrived on the American left and moved up to support the Continentals. With both wings of the 33rd Foot having suffered 2 out of 3 hits Captain Cornwallis withdrew his battalion. The British Legion Dragoons replaced them on the British right. The left wing of the 23rd Foot supported by the Hessian Jägers charged the collapsed infantry of Lee’s Legion. Only Lee’s infantry scored a hit and this was saved. The British lost the melee tie break when the Americans rolled a 6 to their 1. The better British morale could not make up the difference so they retreated disordered. 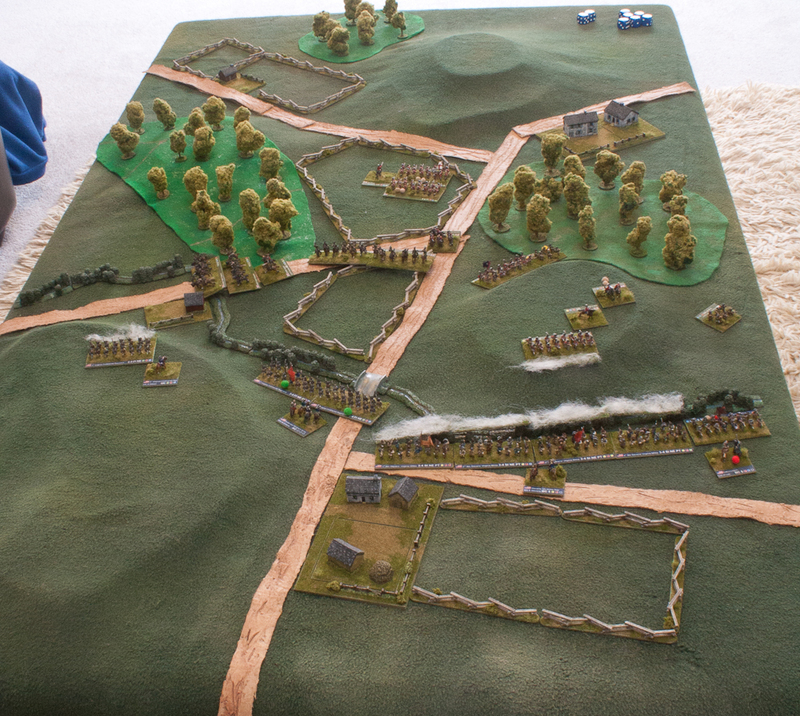 Lee’s infantry withdrew across the stream. Steven’s Militia Brigade deployed along the stream between the Continentals and Lee’s infantry. To their front was the right wing of the 23rd Foot. The four American battalions scored two hits from eight dice destroying the unfortunate right wing of the 23rd Foot. Part of the Fifth Virginia Continental Regiment moved to cover the other bridge and fired ineffectively on the leading British Legion Dragoons. Despite the early British success a winning draw to the Americans. “At War in the Americas” is a lot of FUN! The smaller scale leads to a number of interesting differences from normal Volley & Bayonet. The longer ranges for weapons allow multiple stands to fire at a single stand if it is in an exposed position. Both British battalions fell suffered badly from this. Each stand represents much fewer men and can take fewer hits. One hit destroys Cavalry and Detachments and so they are very fragile. Poor American Militia is really really poor! 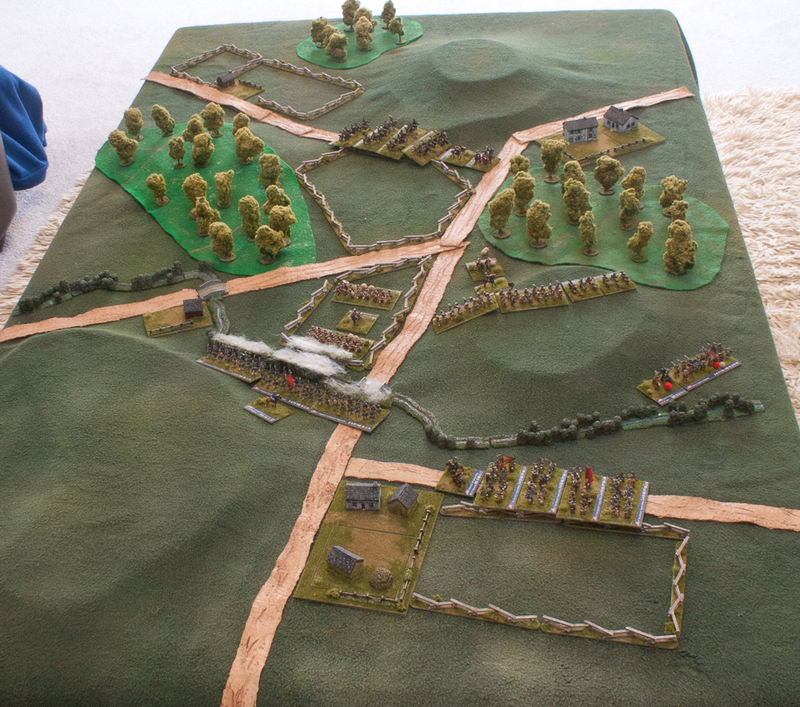 Butler’s Brigade collapsed totally in one turn when charged by half of the 23rd Foot!